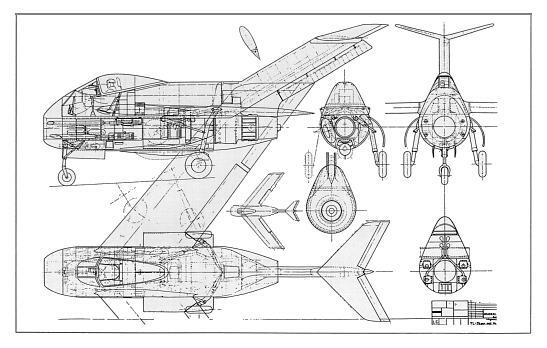 In late 1942, Focke-Wulf engineer Hans Multhopp headed up a design team that started aerodynamic studies for a new turbojet fighter. This culminated in 1945 as a fighter project known as "Huckebein" (a cartoon raven that traditionally makes trouble for others), also known as Project V (Project VI in some references) or Design II at Focke-Wulf and later to be given the designation Ta 183. 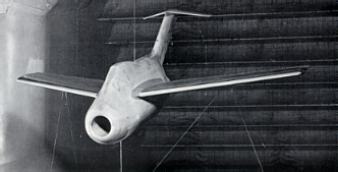 The Ta 183 had a short, squat fuselage with the air intake passing under the cockpit and proceeding to the rear where the single He S 011 turbojet was located, although the first three prototypes were to be powered by Jumo 004B jet engines. A provision was made in the early studies for the aircraft to be equipped with a 1000 kg (2205 lbs) thrust rocket engine to assist interception duties, with the fuel for a 200 second rocket burn being located in underwing drop tanks. The wings were very thin, swept back at 40 degrees and were mounted in the mid-fuselage position. A tapered main wing spar constructed of two duraluminum I-beams with steel flanges formed a torque box, with the attachment at the fuselage consisting of a single bolt. The wing structure was completed by adding bonded wooden ribs with a plywood covering. Each wing panel contained six fuel cells totaling 1565 liters (345 gallons). The huge fin was swept back at 60 degrees, with the tailplane mounted on the top of the fin. 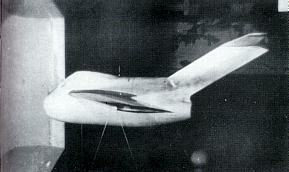 The tailplane also exhibited considerable dihedral. Wing elevons and the rudder provided control, the tailplane control surfaces only being used for trimming. 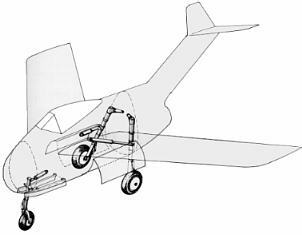 The flaps and landing gear were operated hydraulically. The pilot sat in a pressurized cockpit with a bubble canopy which provided excellent all-around vision. Four MK 108 30mm cannon was envisioned for the production Ta 183 armament, also a bomb load of 500 kg (1100 lbs) could be carried. This could include one SD or SC 500 bomb, one BT 200 bomb, five SD or SC bombs and even a Rb 20/30 camera. 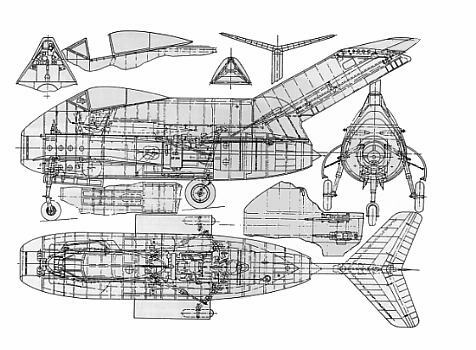 The weapons load would be carried in the equipment space in the bottom of the fuselage and thus partially protrude about halfway from the fuselage. On Febuary 27 and 28, 1945, the Emergency Fighter Competition conference was held by the OKL (High Command of the Luftwaffe), and the Ta 183 was chosen to be developed and produced. 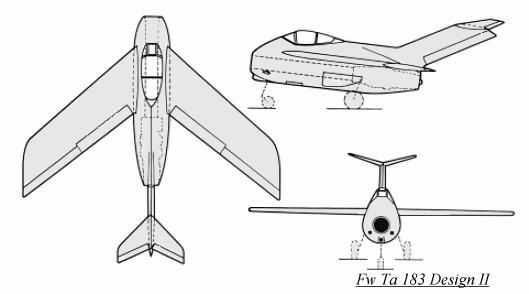 There were to be sixteen Versuchs (experimental test series) aircraft: the Ta 183 V1-V3 to be powered by the Jumo 004B turbojet, pending delivery of the He S 011 jet engine, the Ta 183 V4-V14 as 0-series preproduction aircraft and V15-V16 as static test aircraft. The maiden flight of the first aircraft was planned for May/June of 1945, and was to test both the Design II and Design III tail configuration. The first production aircraft were scheduled to be completed by October 1945, but no examples of the Ta 183 were completed because on April 8, 1945 British troops captured the Focke-Wulf facilities. 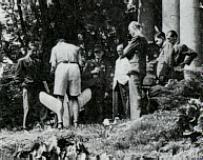 Willi Käther, looks on from the far left and Ludwig Mittelhüber, a Focke-Wulf designer who was not convinced of the model's ability to fly properly, stands to the right of Stampa.